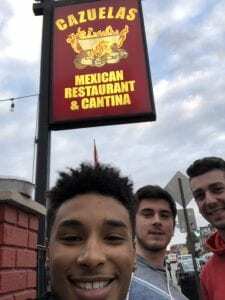 On Sunday, November 25th, including myself with a couple other members of Humanitarian Engineering Scholars, we went to Cazuelas Mexican Restaurant and Cantina for our second Columbus to-do list objective. It was located north of campus in an interesting location, near where I had found my haircut place to be. The setup inside Cazuelas was unique in the sense that it was built inside a house/large apartment that had been transformed into a restaurant with a kitchen in the back of the house. They had large tv’s setup throughout the restaurant and they optimized the space inside for lots of seating which worked out well for watching the football games and serving many people. Also, in the front side of the house, they had a patio, bar setup on the front yard with coverage above. It was fascinating to see the transformation from a house to a restaurant. Overall, the food tasted very good and the service was quick. I would recommend it to a friend and the price to food ratio was very generous so I would be inclined to go back as well. The 1st year, autumn semester, my life has been the most busy and constantly demanding as it has ever been. Yet, understanding the circumstances, I still chose to involve myself heavily in club gymnastics. 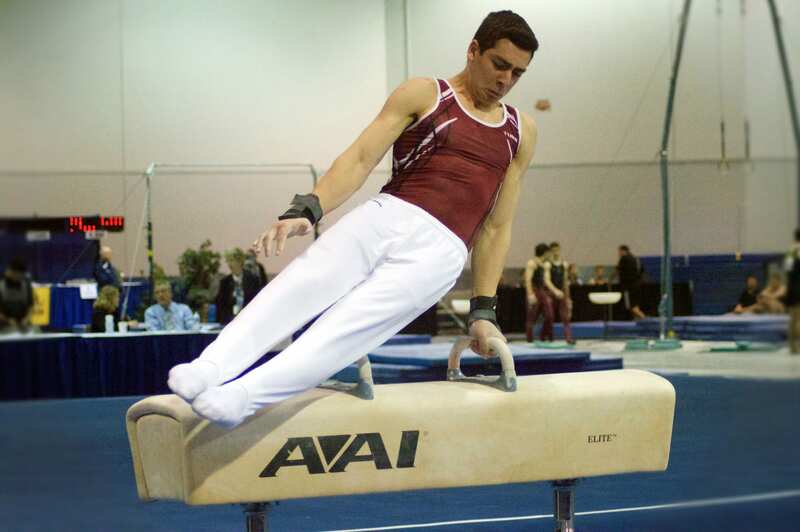 Recently, I had traveled to Virginia Tech for the first time to compete in my first NAIGC gymnastics meet. 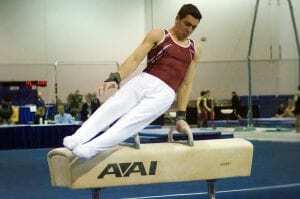 Despite going into the competition with a relaxed attitude, once I got into my routines on each of the six men’s gymnastics events, adrenaline was firing and I was extremely motivated to put it all out there. My work had payed off, capitalizing on a 2nd place floor exercise finish as well as taking the gold on parallel bars. However, these strong accomplishments were not what I wanted to choose as my artifact/experience. I am choosing the 3rd place all around finish to model it. It celebrates my early successes in college club gymnastics but furthermore sparks a reignited flame for the future to continue to push myself mentally and physically for what the future has in store. 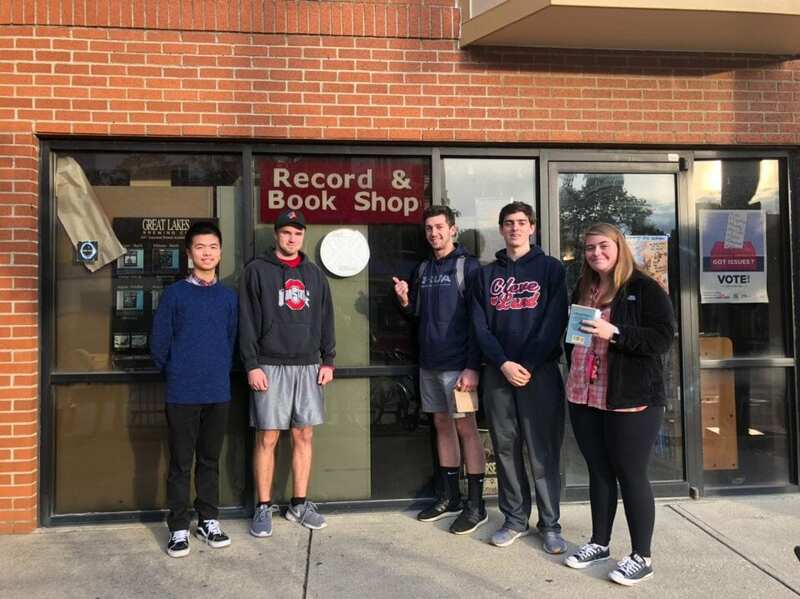 Since the beginning of Humanitarian Engineering Scholars and the introduction of the Columbus To Do list, I have been eagerly anticipating exploring outside of campus, seeing what else the city of Columbus has to offer. My first exposure to this was going to the Short North and exploring the first time around with my peer mentor and our small scholars group. The next adventure was the inevitable feat to finding the best place for a haircut near campus. A found the Mug and Brush to be rated as one of the top 10 barbers in Columbus. 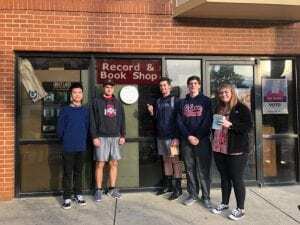 In addition to going out to dinner at the number 1 rated restaurant in Columbus while my father was visiting, I continued to carry on my adventures with my peer group for Humanitarian Engineering Scholars by going to Kafe Kerouac this past Tuesday. The section of Columbus was north of campus on high street in a part of Columbus called Old North Columbus, near where I had gotten my haircut previously. The experience at Kafe Kerouac was very pleasant. Exploring the inside of the cafe, there were two main parts of the cafe, one with several table, a bar setup and lots and lots of books, magazines and other literature. The other room was filled with a small stage which I would imagine attracts ranges of attention when there are performers, as well as what several students were using at a quiet study and work space. It was a very nice atmosphere overall and the muffins were very good. I thought that it was interesting that the theme of the cafe was that of a couple decades ago. On future assignments, however, next time, as long as the group is available, it is highly recommended to finish and plan out the trip to where we decide to go as a group ahead of time. In terms of Kafe Kerouac as a whole, I would recommend the cafe to a friend and I would go back to try their hot chocolate as a friend got one when they went last time and explained how it is definitely worth it. As long as I can remember, gymnastics has been arguably the most prevalent aspect of my life consistently for years. Especially over the past few, it has contributed to many factors that I believe have transformed me into the person I am today. 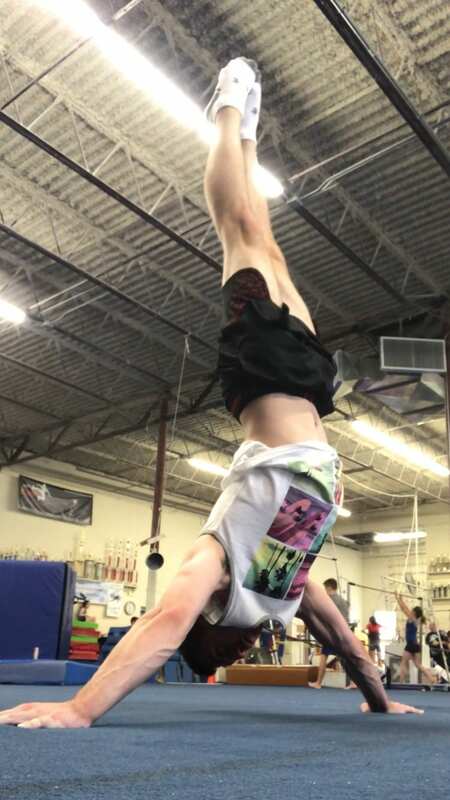 This specific artifact I am highlighting is one of the most important skills taught and perfected by gymnasts throughout the rigorous training. The idea of a handstand can be translated to possess many different significant metaphors connected to my ideology. 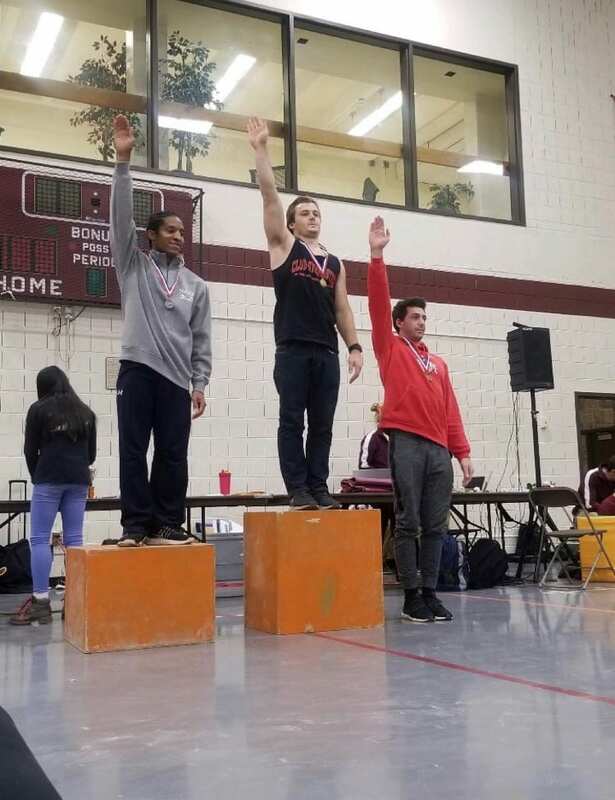 The literal blood, sweat and tears that have been put into the grit filled practices and competitions, working 24 hours a week in high school have truly built me, helping me across the board. Overall, in addition to the handstand, a difficult, goal-based feat, most definitely, I have applied the attributes I learned from my time at gymnastics in high school to foster my future success. My name is Zachary Dancoes and I am a first year student at The Ohio State University pursuing a mechanical engineering degree and an economics minor. I am on the Club Gymnastics team and I have been training for 14 years and competing for 12 years. 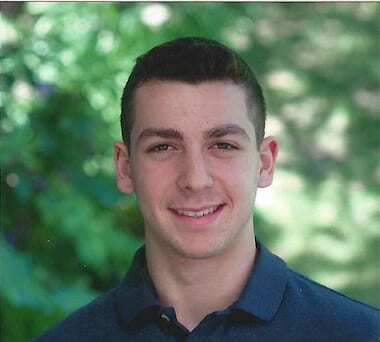 My ultimate gymnastics goal is to walk-on within the next couple years and make the NCAA Men’s Gymnastics Team at Ohio State and compete at least one event for the team at one of the competitions during the year. My passions stem outside the classroom but I also thoroughly enjoy learning compelling material inside the classroom. 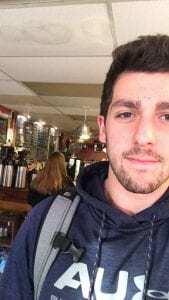 Not only does the topic of economics interest me, but engineering as a whole, embodies the idea of developing a certain type of mindset, an ideal model for generating success in the future. I uphold a engaged role with my commitment to the Humanitarian Engineering Scholars program and am eager to further advance my engineering education and my academic career at Ohio State and beyond. I am looking to become involved in engineering internship opportunities and co-ops to increase my exposure and experience in the field of engineering. I expect to maximize my productivity throughout my college career and potentially study abroad if I get the opportunity. I plan to keep my future options open and am trying to learn as much as I can through my college experience. After taking the Strengths Finder Assessment, there were 5 strengths that were highlighted that best reflect myself, who I am and where I excel. My greatest strength was Achiever, followed by Analytical, Futuristic, Discipline and Competition. I am able to explicitly see and dissect how each of these strengths are evident in my life. As an achiever, I use this motive as a means to mark my progress and growth with the feats I complete. The lens I see through is with the eyes of motivation rooted in achievement and accomplishment. The next theme and strength of being analytical is derived from the way I think, especially as an engineer. Throughout my interactions with other people, I like when others (including myself) support their claims with substantial, convincing evidence. The following strength is how I value and apply the idea of being futuristic. This way of thinking stems from my dreams for living in the future and how I can be successful with all that I do. The strength of Discipline heavily resonates with me and how I conduct myself in the sense that it is one of the most powerful traits that can be positively implemented to help many people. I have found enacting this throughout my childhood and focus to continue to use it in the future. The last strength that was connected to my by means of the CliftonStrengths Assessment is competition. I have found that a lot of my life has been based around the idea of positive and supportive competition, catalyzing the pursuit of greater success constantly striving to better myself and support the people around me.